Our high-pressure cleaning services in Sydney get the best results due to our commercial quality equipment and our trained team. Our competitive prices mean that pressure cleaning is an affordable way to have your home looking great again without you having to spend the time doing it. For competitively priced, efficient and safe pressure washing in the Northern Beaches, Upper and Lower North Shore, Eastern suburbs and the Inner West, contact Pressure and Steam for a free quote. 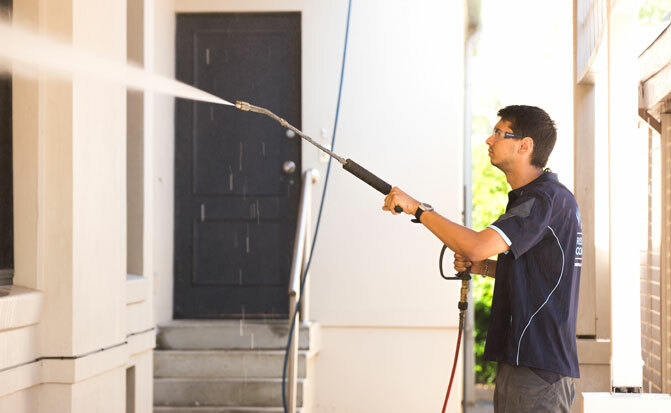 We work for building managers, sales agents and strata managers to pressure wash all types of commercial properties. Our team is highly trained to complete a quality job. You won’t need to call us back to re-do a job. We’ll give you a long lasting clean the first time. For competitively priced, efficient and safe pressure washing for commercial properties, contact Pressure and Steam’s Northern Beaches office for a free quote. We’re available NSW wide. We’re quick to quote, reliable and we’ll stay in touch on the day so you’ll know exactly when we’re coming. We don’t leave our clients waiting around. We’re careful to firstly assess your home or commercial property’s outdoor surfaces as every surface is unique and requires different cleaning techniques. We adhere to all environmental regulations ensuring we have a minimal effect on your gardens, neighbours and nearby properties. For situations where run off would go down storm water drains, we use a capture system to ensure our work complies with regulations by preventing run off into storm water drains. Our team is professionally trained and certified in safely pressure cleaning all types of homes and commercial properties. The head technician working on each pressure cleaning job has completed vocational training through ITI.